What is the evidence that there are mass graves at the Belzec death camp? Excavations from 1997 to 2000, which located and mapped 33 mass graves at the Belzec death camp, revealed only traces of whole human remains. These traces are not evidence of mass murder, but are the result of death by disease and hardship while Jews were being deported farther east. The results of two separate investigations, despite being 60 years apart, prove that there are more than “several hundred corpses” buried at Belzec. These investigations support the conclusion that some 450,000 Jewish men, women, and children were murdered and buried at Belzec. What do Holocaust deniers say specifically about Belzec and its mass graves? Carlo Mattogno, an Italian Holocaust denier, makes two major claims about the mass graves at Belzec. First, he asserts that the 33 mass graves contain “at most several hundred corpses” (unburned bodies). Second, Mattogno claims that the amount of ashes and bone fragments in the graves is “absolutely incompatible” with the remains of 450,000 people supposedly buried at Belzec. Mattogno then suggests that the lack of remains and lack of ashes indicate that the Nazis sought to resettle Jews farther east, a policy that showed a “very severe German attitude toward the Jews,” but not mass murder. There have been two investigations at Belzec—one in 1946 and the other between 1997 and 2000—which conclusively show that there are mass graves in Belzec. In 1946, Czeslaw Godzieszewksi, the Regional Investigative Judge of the District Court of Zamosc, investigated of the grounds of Belzec. The Polish investigators dug 9 trenches about 10 meters (33 feet) across and 8 meters (26 feet) deep. In them, they found meters-thick layers of human ashes, as well as the charred remains of human bodies, body parts, women’s hair, and unburned human bones. In one 26-foot-deep trench alone they found a layer of human ashes 3 meters thick (about 10 feet). Between 1997 and 2000, a team of experts including archeologists, historians, and cartographers exhaustively and scientifically surveyed the entire site of the camp. The research was authorized by the Polish government and the United States Holocaust Memorial Museum. The team was headed by Professor Andrzej Kola of the University of Torun in Poland. He undertook the study because the Polish authorities were replacing the Belzec memorial and they did not wish to disturb the mass graves when they designed and constructed the new memorial space. Over a period of three years, Kola’s team drilled 2,001 soil cores five meters (16.5 feet) apart to a depth of six meters (20 feet). They drilled these holes in a grid pattern that covered the entire area of the camp. The Kola investigation found that Belzec was “one large patchwork of mass graves.” The investigators located and measured 33 mass graves, which had a total volume of approximately 15,840 cubic meters, or approximately 560,000 cubic feet. Today, the mass grave sites at Sobibor have been covered by a field of memorial stones. Grave 20 extends outside the current camp boundaries and so could not be completely measured. The part that could be measured is 26 meters long by 11 meters wide by 5 meters deep (85 feet by 36 feet by 16 feet deep). It is unreasonable to believe that the Nazis, using heavy excavators, dug three graves so large and so deep just to bury the “rare corpses” of Jews who died on their way to the East. Why were there unburned human remains in the mass graves? We cannot say for sure why there are whole human remains in the graves, but it is reasonable to suppose several options. One of the reasons might be that the condition of the bodies at the bottom was so terrible that the Nazis—even though Jewish slaves did the work—might not have been able to face exhuming them. Perhaps, after long months of exhuming and burning the remains, the Nazis wanted to finish the job and get out of that miserable place as quickly as possible. Despite their desire to eliminate the evidence of mass murder, leaving some unburned bodies 25 feet below the surface probably did not seem like a very big risk. Claim 2: The amount of ashes and bone fragments in the mass graves is very small. Grave 5 contains “pieces of burnt human bones so densely packed together that the drill could not penetrate further.” The grave is 32 meters long by 10 meters wide by 4.50 meters deep (about 105 feet by 33 feet by 15 feet deep). Graves 3, 10, 11, 12, 13, 15, 16, 17, 18, 19, 21, 22, 23, 24, 25, 27, 28, 29, 30, 31, 32, and 33 all contain fragments of burnt human bones, human ashes and carbonized wood. The ashes and bone remnants are not just in the graves either. Kola’s team found ash and bone mixed with sand on the surface of the soil. Why the human remains have not been fully exhumed? Mattogno complains that his questions could be easily solved by a thorough and proper exhumation of the sites; this would, at least he claims, settle the matter once and for all. However, exhumation was not Kola’s goal. Rather, he was mapping the mass graves in anticipation of building a new memorial at Belzec. Even if a full exhumation had been Kola’s aim, he would have been unable to complete the task because at least one of the larger mass graves extends outside the current boundaries of the camp. It extends onto private land and could not be investigated. In addition, some religious figures objected to the investigation being done at all, feeling that any disturbance of the graves was a violation of the dead. Digging up the mass graves to quantify the ashes and bone remnants would have been intrusive and disrespectful, also raising a storm of controversy. Therefore, every effort was made to disturb the mass graves as little as possible. The self-named “Denierbud,” an American YouTube video maker and Holocaust denier, makes the same complaint about Belzec and Treblinka. He contends that the “lack of searching for physical evidence is shocking.” He then states that Kola was handpicked because “they” knew he would not find anything that “didn’t support the story.” Denierbud wants both camps entirely excavated to prove that it is not all a “big lie.” The same ethical considerations outlined above—as well as practical considerations for excavating every square foot to a depth of 20 feet—applies to his complaint. Holocaust deniers intend to diminish the number of victims to “at most several hundred”; this reduction is not supported by the evidence. Two separate investigations 60 years apart show that the remains of some 450,000 Jewish men, women, and children are buried at Belzec. 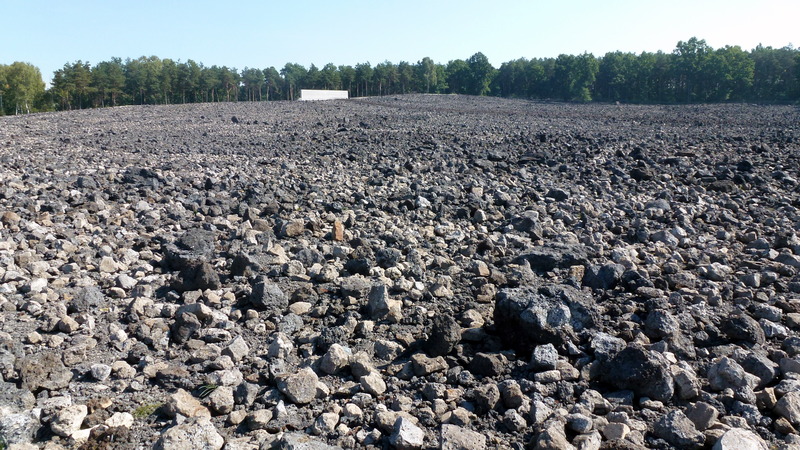 Field of stones covering mass graves in Belzec. By Lysy (Own work) [CC BY-SA 3.0 (http://creativecommons.org/licenses/by-sa/3.0)], via Wikimedia Commons. Carlo Mattogno, Belzec in Propaganda, Testimonies, Archeological Research, and History (Theses & Dissertations Press, 2004), 79 at http://vho.org/dl/ENG/b.pdf. Carlo Mattogno, Belzec in Propaganda, Testimonies, Archeological Research, and History (Theses & Dissertations Press, 2004), 87. Carlo Mattogno, Belzec in Propaganda, Testimonies, Archeological Research, and History (Theses & Dissertations Press, 2004), 99. Jonathan Harrison, Robert Muehlenkamp, Jason Myers, Sergey Romanov and Nicholas Terry, Belzec, Sobibor, Treblinka: Holocaust Denial and Operation Reinhard. A Critique of the Falsehoods of Mattogno, Graf and Kues, 383 at http://holocaustcontroversies.blogspot.com/2011/12/belzec-sobibor-treblinka-holocaust.html. Select Google Docs, Rapidshare or Archive.org for a PDF version. “Archeological Investigation: Belzec: A Review by Historians” at www.holocaustresearchproject.org/ar/modern/archreview.html. The entire study by Andrzej Kola entitled Belzec: The Nazi Camp for Jews in the Light of Archaeological Sources, Excavations 1997-1999 (Council for the Protection of Memory of Combat and Martyrdom and United States Holocaust Memorial Museum, 2000) can be downloaded at www.scribd.com. Andrzej Kola, Belzec: The Nazi Camp for Jews in the Light of Archaeological Sources, Excavations 1997-1999 (Council for the Protection of Memory of Combat and Martyrdom and United States Holocaust Memorial Museum, 2000), 40, The entire book can be downloaded at www.scribd.com. An excerpt from the study can be read at http://www.jewishgen.org/Yizkor/belzec1/bel150.html. Although Kola calculated 21,000 cubic meters, the 15,840 figure is the estimated adjusted volume when considering that many graves were irregular in shape, the sides of the graves probably sloped and the bottoms may have been uneven. See Jonathan Harrison, Robert Muehlenkamp, Jason Myers, Sergey Romanov and Nicholas Terry, Belzec, Sobibor, Treblinka: Holocaust Denial and Operation Reinhard. A Critique of the Falsehoods of Mattogno, Graf and Kues, 387 at http://holocaustcontroversies.blogspot.com/2011/12/belzec-sobibor-treblinka-holocaust.html. Select Google Docs, Rapidshare or Archive.org for a PDF version. Carlo Mattogno, Belzec in Propaganda, Testimonies, Archeological Research, and History (Theses & Dissertations Press, 2004), 78. Andrzej Kola, Belzec: The Nazi Camp for Jews in the Light of Archaeological Sources, Excavations 1997-1999 (Council for the Protection of Memory of Combat and Martyrdom and United States Holocaust Memorial Museum, 2000). See “The grave pits in Belzec,” 21–40. This volume can be downloaded at www.scribd.com. You may see the detailed map of the mass graves found on the site and the meticulous diagrams of the dimensions and contents of the mass graves at http://holocaustcontroversies.blogspot.com/2006/05/carlo-mattogno-on-belzec_23.html. See “Carlo Mattogno on Belzec Archaeological Research–Introduction and Part 1, 1. Nature and Purpose of Kola’s Archaeological Investigation”) at http://holocaustcontroversies.blogspot.com/2006/05/carlo-mattogno-on-belzec.html. See “One Third of the Holocaust” at http://www.youtube.com/watch?v=taIaG8b2u8I at approximately 2:31 minutes.